We faced a hot, sunny afternoon today. Armed with a 50′ x 3′ heavy duty contractor drop cloth, a package of U-shaped garden stakes, and several jugs of water, we made our way to a nearby park where there was a big hill and…. 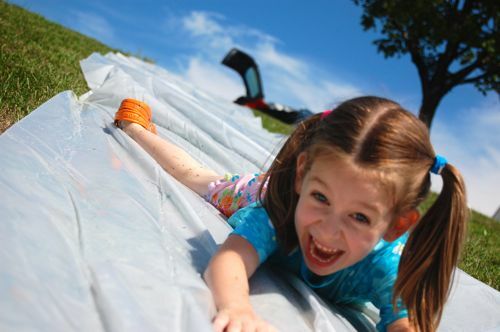 …..and made our own Slip N Slide!! Emily thought this was the most awesome thing EVER!!! We unrolled the drop cloth down the hill, and pierced garden stakes through it on both sides, every 4 feet or so to keep it in place. Put down some water, get a good running start…. and slide!!! Who can resist this much fun??? oohh my goodness this looks like a wonderful hot summer day activity!! Emily said she was quite refreshed! And she was all tired out from all the running and sliding! What a terrific hill – so much potential for fun! At times I wish our yard had a hill, but then again it would be kind of a pain for Mark to mow…. 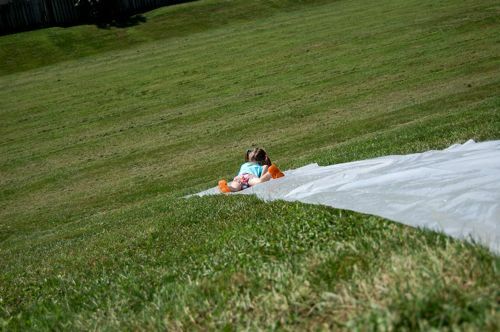 but when we have good snow for sledding or weather for something like this slip and slide… then I wish we had a hill in our yard. The park worked out perfectly!! That is the most awesome thing EVER! 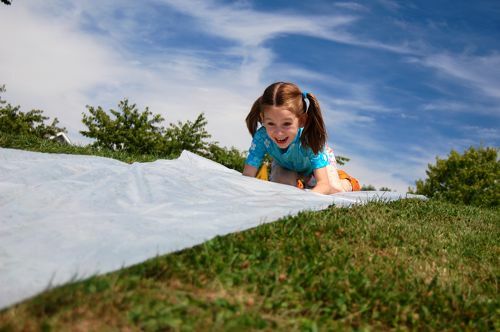 My kids love to slip & slide, but we have never made our own. Very cool! We don’t have one, but several of Emily’s friends do and I think she loved this version of it. It’s fun!! Emily needs to gain some more weight — then she will really pick up speed! 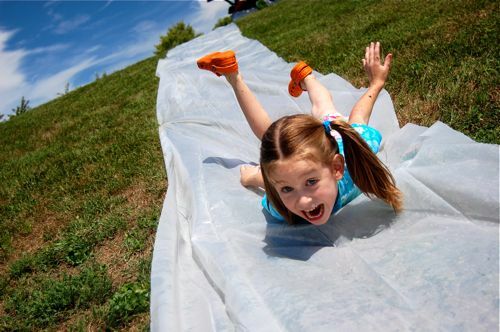 Slip and slides are so much fun! We made one out of thick plastic a few years ago and the kids had a ball! Oh, this reminds me so much of camp! At the High School week every year, they create a crazy long Slip ‘n Slide- which of course ends in a giant mud puddle! Okay, love the idea of taking it to a local park and dousing it with water. Now can I carry enough water to do that? You can see our car parked at the top of the hill, so I didn’t carry the water very far at all. Then again, I’m a tiny and scrawny weakling, so you’d probably be fine! Looks fun and I’m glad to see she’s going head first! LOL — Ouch! It took Emily a couple of tries to really get going. She kept trying to perfect her technique, but I don’t think it occurred to her to try going feet first. Probably a good thing!! It looks like too much fun. How did you manage to bring all the equipment to the park – it must have been quite a load! The drop cloth rolled up and doesn’t take up a lot of room, but I did bring several jugs of water. Fortunately, I didn’t have to lug them far because the hill was right near where I could park the car. It’s a good thing too, because I’m a tiny weakling!! Thanks so much for the link, Alison! I really appreciate it!! xoxo 🙂 You have other great ideas there too!! We made a big on of these in our back pasture for a sixth grade graduation party. To make it extra fast for these kids we put dish soap and baby oil in a sprayer and sprayed the slide. Those kids FLEW down that thing. Big Fun! Woah!! I bet it was a lot of fun!!! What an awesome series of photos! She sure does look like she’s having a fantastic time. That looks like it was allot of fun. Yes, next time you must try it! Hey Valerie! 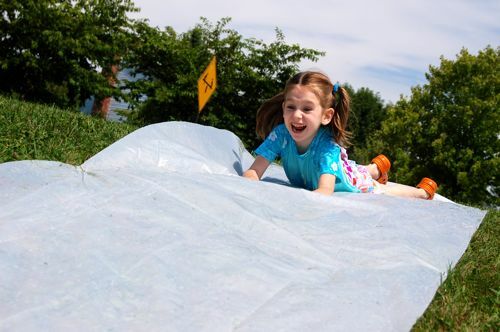 A classic water day – the slip-n-slide – and so nice to have a DIY version! I included this in a roundup of ways to beat the heat with water and ice – I also included your pretend laundry too! You are always full of amazing ideas!